First, as a side note....CANADA just won another GOLD MEDAL in Ladies Snowboard Cross - Maelle Ricker!!!!!! Way to go!!! Now for another card. 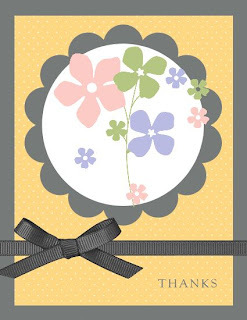 This is a Thank You card using My Digital Studio. You can easily re-create this card using traditional cardstock and stamps, etc. Colors Used: Basic Grey, So Saffron , Certainly Celery, Pretty in Pink and Almost Amethyst.